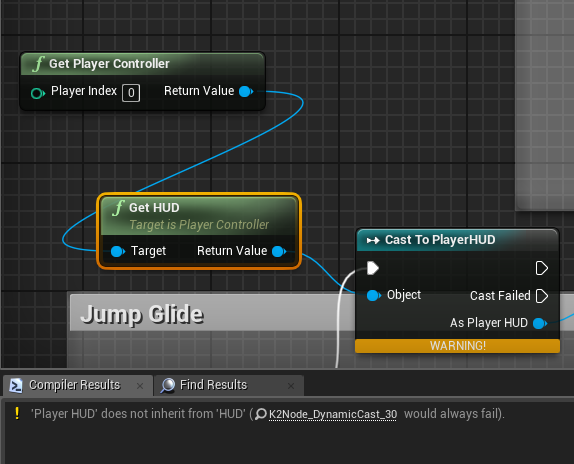 When I try to communicate to my PlayerHUD widget blueprint it gives me this error. It has become quite a pain trying to work around and I couldn't find anyone else with this issue online. If I try to reparent the blueprint class for my custom 'PlayerHUD' it doesn't even have an option to change it to HUD. Where did I go wrong? Here's the image of my issue. That because HUD class is compliantly different UI system, it is classical HUD canvas from UE3. With UMG you need to store widgets you create in varable (the create widget node output created widget) in order to refrence it. you can do so in any class, like PlayerController, or you can even use HUD class (you would need to create one) if you like. Note that best practice is for widget to grab data on it's own insted of talking to it to update. This will save up a lot of mess with casting and such. Slate/UMG has binding system which let you bind widget information directly to data it should display, by function or directly. Possible to use event to trigger text change in HUD? Race Timer Setup Issue.. Please Help? Why is getting widget reference failling?